Today we have been out and about taking photos for our next Winter catalogue in our home village of Hadlow. Mentioned in the Doomsday book, Hadlow is situated in the Medway Valley, approximately 25 km south-east of London. Residing in the Kentish countryside, we are surrounded by many historical buildings, including hop ousts and a medieval church. Carr and Westley itself is located in a converted water mill where we have been making our products for the last 70 years - moving down from London to avoid WW2 bombing. There are many interesting buildings here but perhaps the most interesting is the Castle Tower for which Hadlow is well known. The Castle Tower, or May's Folly, is a really unique and unusual piece of 19th century architecture. Of Victorian Neo-Gothic design, the tower was conceived by the naval architect Ledwell Taylor and built by local landowner Walter Barton May in 1835. It is one of the tallest folly's in Britain and had no original purpose other than for decoration. However, during WW2 the building was used as a lookout point for the Home Guard. Following the war, the tower fell into disrepair but was saved from complete demolition in 1951 by the painter Bernard Hailstone. In 1987, however, the grade 1 listed tower was badly damaged in a great storm with the lantern, gables, buttresses and roof suffering heavily. After the storm it's condition worsened rapidly and as a result it was added to a list of the 100 most endangered sites in the world in 1998. Following a series of local council meetings the public set up the Save Hadlow Tower Action Group (SHTAG) in a bid to get the building repaired. Although the tower was originally built for ostentation not habitation, it had been partly converted for residential use in the mid-1970s. This meant it was necessary to acquire the building through Compulsory Purchase before any restoration funding could be granted and refurbishment work started. As a result of SHTAG campaigning, in 2011 the Vivat Trust agreed to commit to the restoration project in its biggest development project to date. Upon acquisition, the Trust developed a scheme to convert the tower into premium holiday accommodation in conjunction with public access (a condition of lottery funding). Other restoration donations came in from the English Heritage, the Architectural Heritage Fund, Kent County Council and the Country Houses Association. 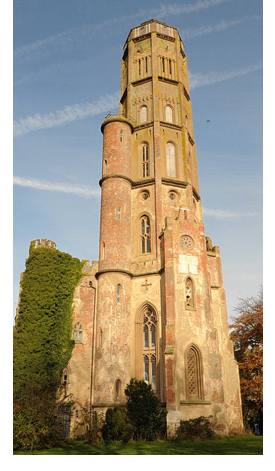 You can read more about the Hadlow Tower Restoration Project here. This entry was posted in Community on April 10, 2012 by admin.